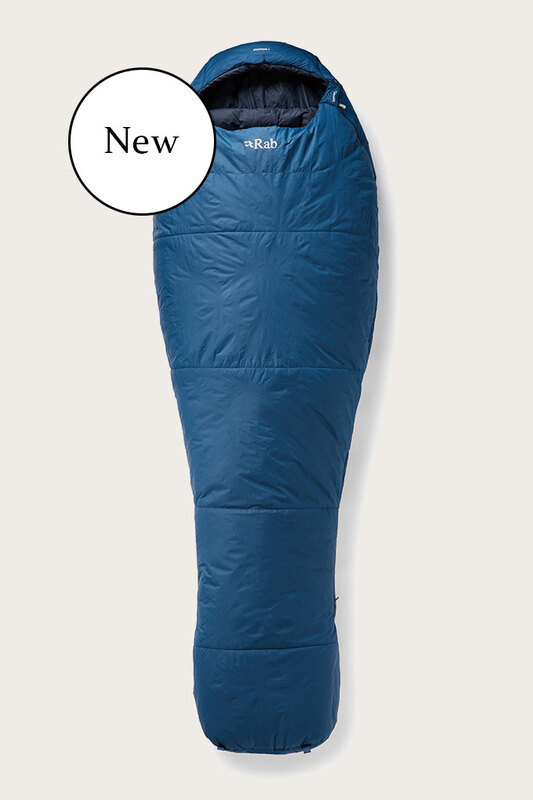 The pinnacle of innovation, the Mythic 600 Sleeping bag is an ultra lightweight down sleeping bag with the best warmth to weight ratio in the Rab range. 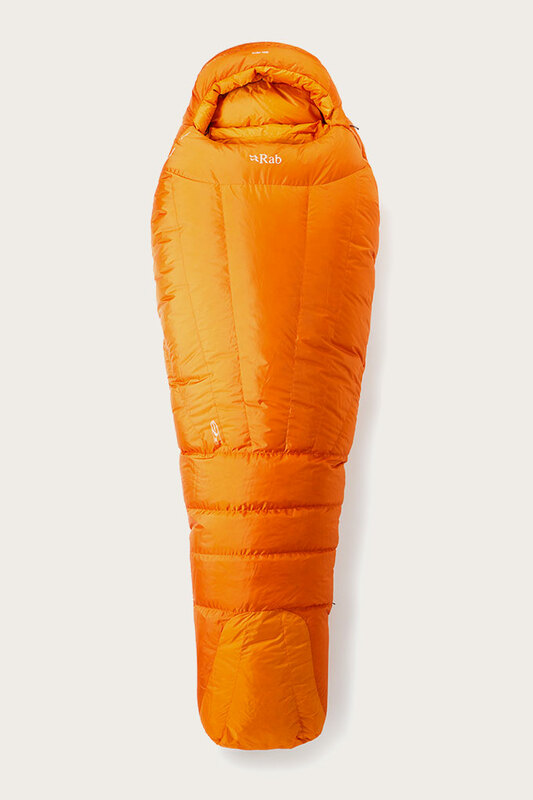 Designed for mountain activists looking to reduce weight while moving through the mountains, it's perfect for use in cold environments where weight and packsize are crucial to success. 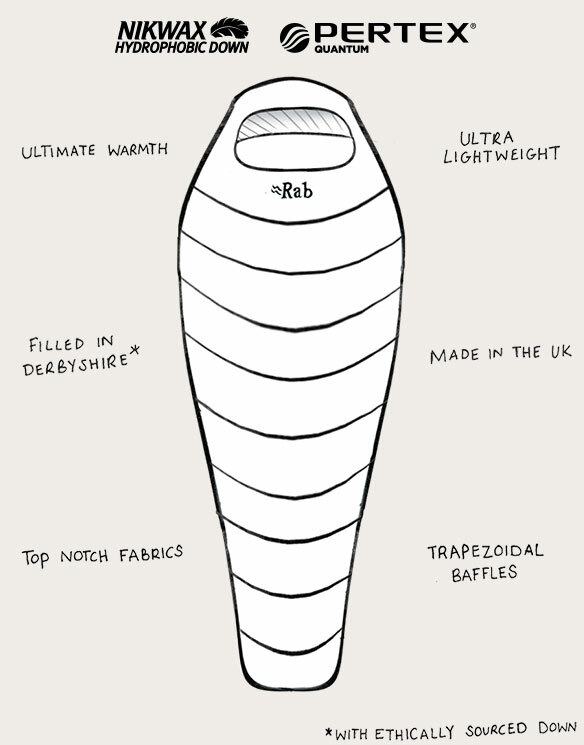 Rab uses Ethical, Responsibly Sourced Down from the European Union. 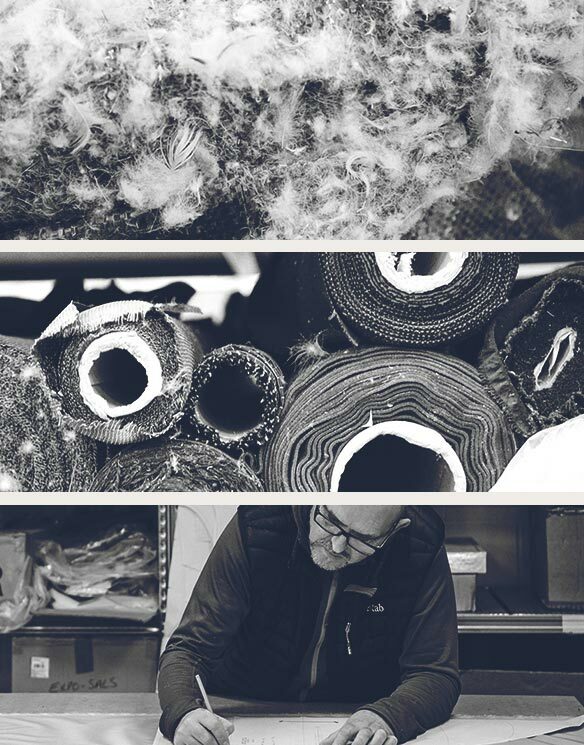 Since our beginnings when Rab Carrington hand stitched the first sleeping bag to bear his name, Rab design has drawn on experience from years spent in the mountains. The Mythic continues that tradition, once again pushing the boundaries in innovation and design. 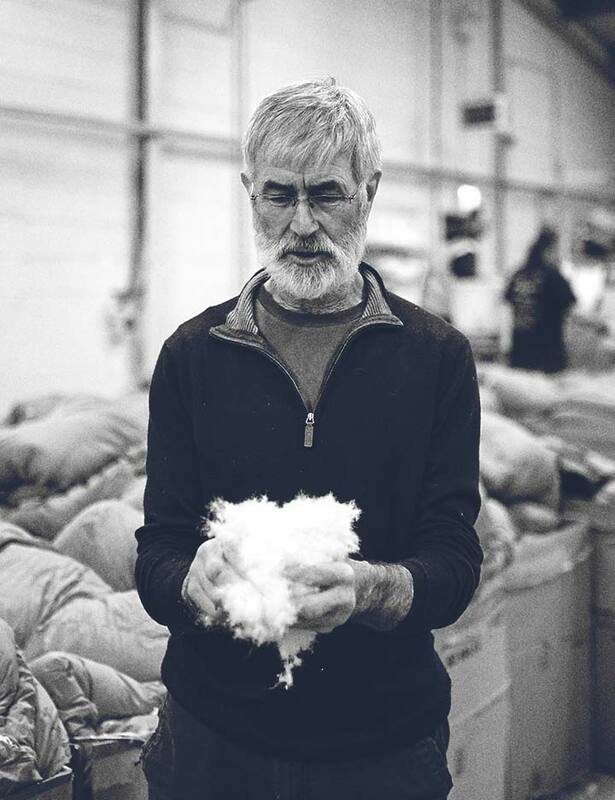 Weighing in at 885g the Mythic contains 600g of the highest quality 900 fill power ethically sourced European Goose down. Achieving an exceptional warmth to weight ratio, this bag retains all the features you need to stay warm and protected in cold mountain environments. The tapered mummy shape with angled foot box gives a generous fit for the weight. Weight saving baffle construction prevents down shift, while the chambers are angled downwards in chevrons keeping the down over the centre of the body to ensure core warmth throughout the night. Each bag is hand filled in Derbyshire using Hydrophobic down developed in conjunction with Nikwax®. The internal collar is ergonomically designed, and collar, hood, and internal baffles have drawcords which can be cinched in for extra warmth. Designed with a three-quarter length YKK main zip with glow in the dark puller, the two way zip can be opened for additional ventilation, while the bonded zip guard works as a draught excluder. Super lightweight trims and features reduce weight, and the dry bag compression stuffsack ensures protection from the elements and a smaller packsize while on the move. Every element of the Mythic 600 is designed to deliver optimum warmth for minimum weight, allowing you to withstand the challenges of moving fast and light in alpine environments. We are masters of insulation. 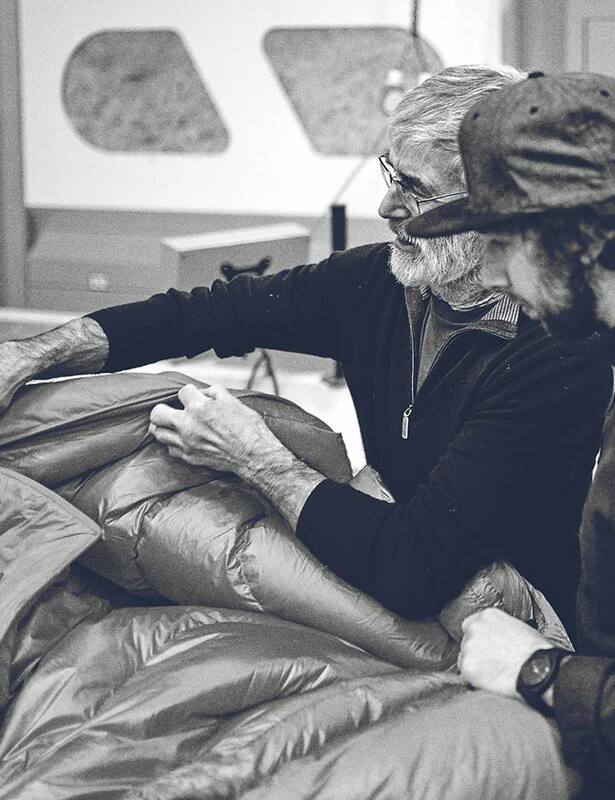 It’s been over 30 years since the first Rab sleeping bag was hand cut, sewn and filled in a small terraced house in Sheffield. Having spent years in the mountains Rab Carrington’s original designs were inspired by his experience. 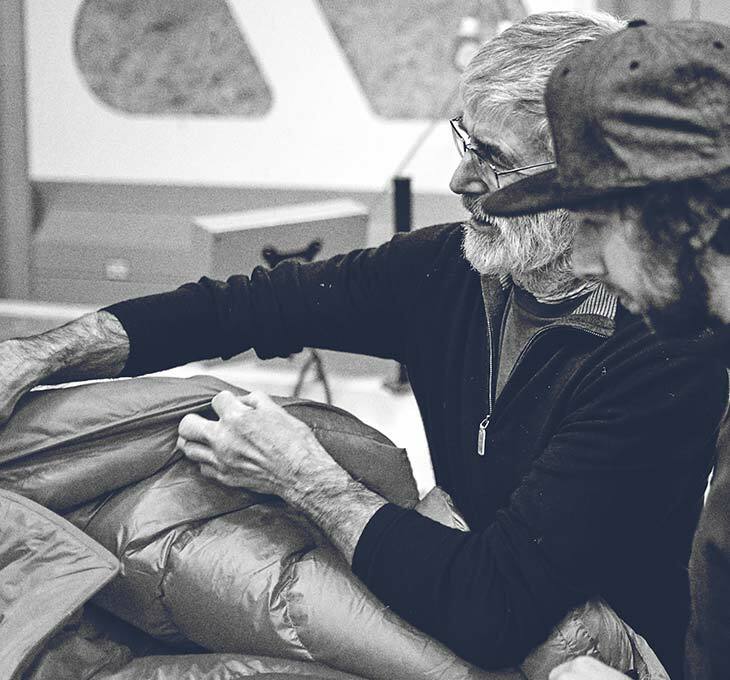 Making products for climbers by climbers, function and performance lay at the heart of his designs. Filled, stitched and finished in Derbyshire, his same values have been carried forward to the present day. 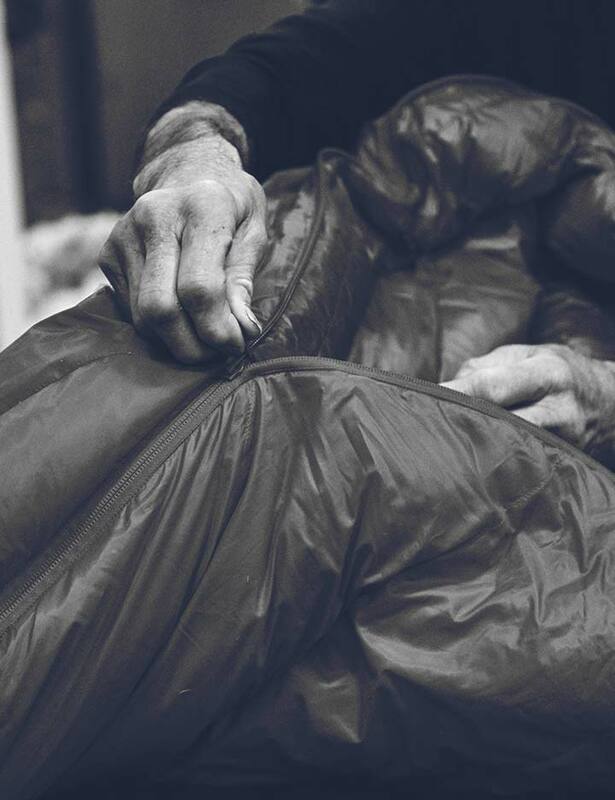 By paying attention to the smallest detail and simplest innovation, we remain committed to making sleeping bags that will last a lifetime. Nous sommes les maitres de la chaleur. Voilà plus de 30 ans maintenant que le premier sac de couchage Rab a été découpé, cousu et garni à la main dans une petite maison mitoyenne de Sheffield. Rab Carrington s’inspirait de ses nombreuses années d’expérience en montagne pour réaliser ses designs originaux. En fabriquant des produits pour les grimpeurs par les grimpeurs, il mettait la praticité et la performance au cœur de ses designs. Ses mêmes valeurs sont toujours d’actualité, nos produits étant garnis, cousus et finis dans le Derbyshire. L’attention que nous portons au détail le plus infime et à l’innovation la plus simple nous permet de fabriquer des sacs de couchage qui durent toute une vie. 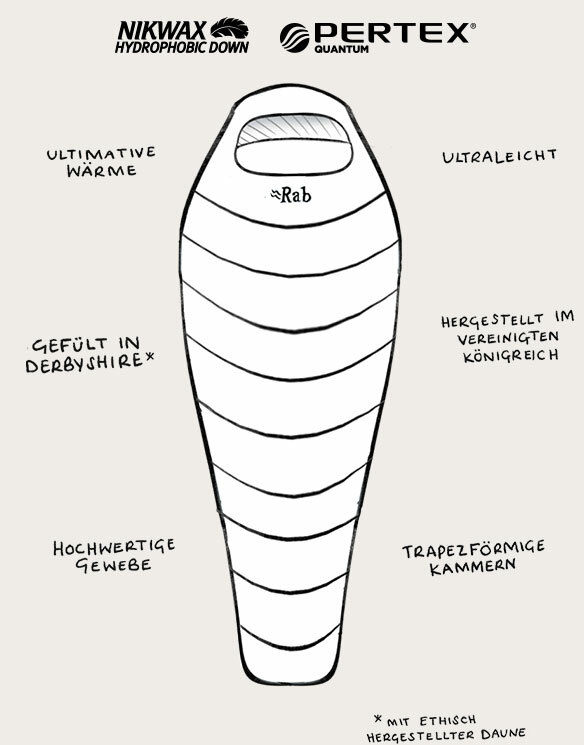 Es ist bereits über 30 Jahre her, dass unser erster Rab-Schlafsack in einem kleinen Reihenhaus in Sheffield von Hand zugeschnitten, genäht und befüllt wurde. Die ursprünglichen Entwürfe von Rab Carrington waren von seiner jahrelangen Erfahrung in den Bergen geprägt. Die Herstellung von Produkten, die von Kletterern für Kletterer konzipiert wurden und mit vielen Funktionen und hervorragender Leistung überzeugen, war der wichtigste Design-Aspekt. Diese Werte stehen bis heute im Mittelpunkt – so werden die Schlafsäcke immer noch in Derbyshire befüllt, genäht und fertiggestellt. Durch unsere Liebe zum Detail und zu schlichter Innovation setzen wir uns auch weiterhin dafür ein, Schlafsäcke zu fertigen, die ein Leben lang halten. 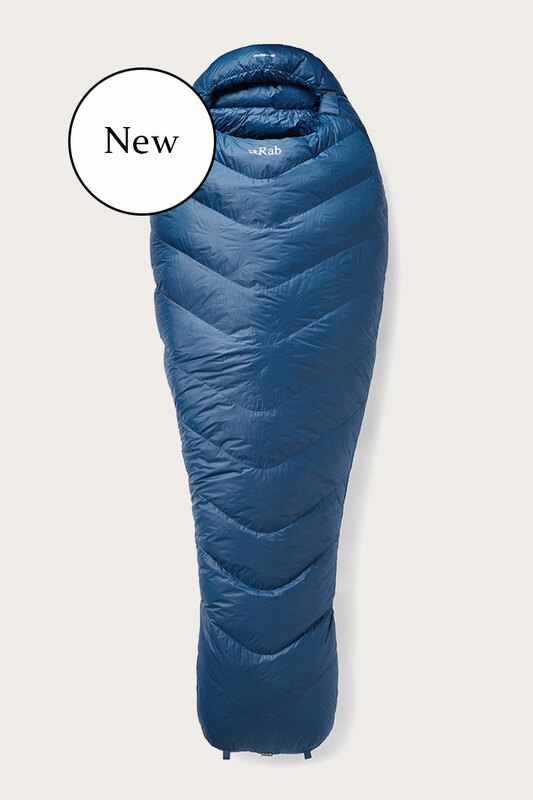 The warmest sleeping bags in our range with a cut to allow layering, designed for use on expeditions to 8000m peaks and in polar environments. Spécialement conçus pour les expéditions à 8 000 m d’altitude et les milieux polaires, ce sont les sacs de couchage les plus chauds de toutes nos gammes. Leur coupe rend possible la superposition des couches de vêtements. Die wärmsten Schlafsäcke in unserem Sortiment mit einem Schnitt, um mehrere Schichten zu ermöglichen. Sie wurden entwickelt, um selbst Expeditionen in Höhen von 8000 m und in Polarregionen standzuhalten. Offering similar warmth to the Expedition range in a more performance-orientated shape, the Andes maximises warmth-to-weight with a reduced pack size. Les sacs de couchage de la gamme Andes offrent un niveau de chaleur comparable à ceux de la gamme Expedition, avec une forme plus orientée sur la performance, un ratio poids/chaleur optimal et une bonne compactibilité. Diese Schlafsäcke bieten eine ähnliche Wärmeleistung wie die Schlafsäcke der Expedition-Reihe, nur sind sie leistungsorientierter. Andes-Schlafsäcke bieten ein hervorragendes Wärme-Gewicht-Verhältnis bei kleinem Packmaß. Featuring the best warmth-to-weight ratio in the Rab range, the Mythic range is optimised for moving fast and light in alpine environments. 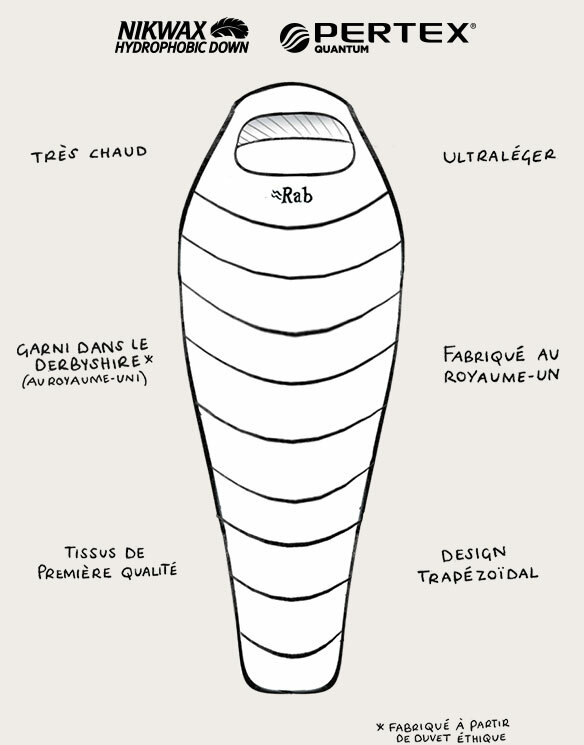 Parfaits pour se déplacer rapidement et en toute légèreté dans des environnements alpins, les sacs de couchage de la gamme Mythic offrent le meilleur ratio poids/chaleur de toutes les gammes Rab. Das Mythic-Sortiment bietet das beste Wärme-Gewicht-Verhältnis der gesamten Produktpalette von Rab und wurde für leichte, schnelle Touren in Alpinregionen entwickelt. Durable and weather resistant, the Neutrino Pro is designed to take you from big wall bivi ledges through to lightweight mountaineering and cold winter conditions. 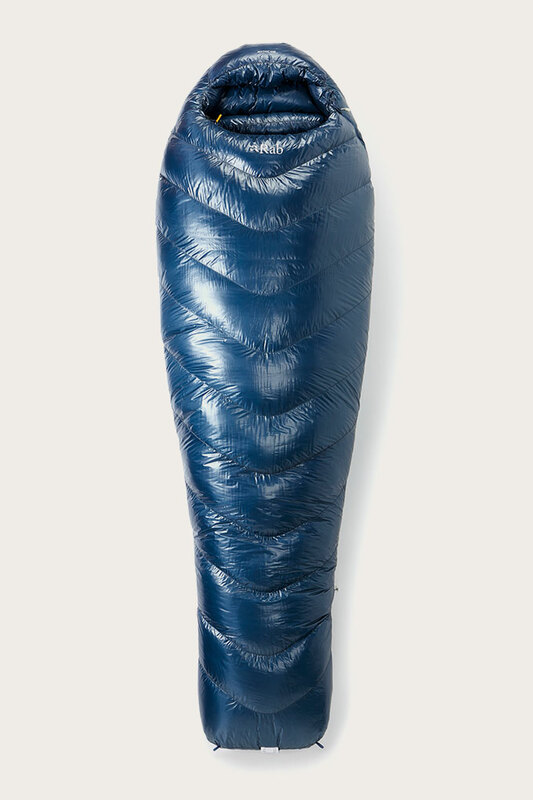 Durables et résistants aux intempéries, les sacs de couchage de la gamme Neutrino Pro conviennent parfaitement aux alpinistes, aux séjours en montagne nécessitant légèreté et aux conditions hivernales rigoureuses. Der Neutrino Pro ist robust und wetterfest und ist so ideal für alpine Klettertouren, leichte Bergtouren und kaltes Winterwetter geeignet. 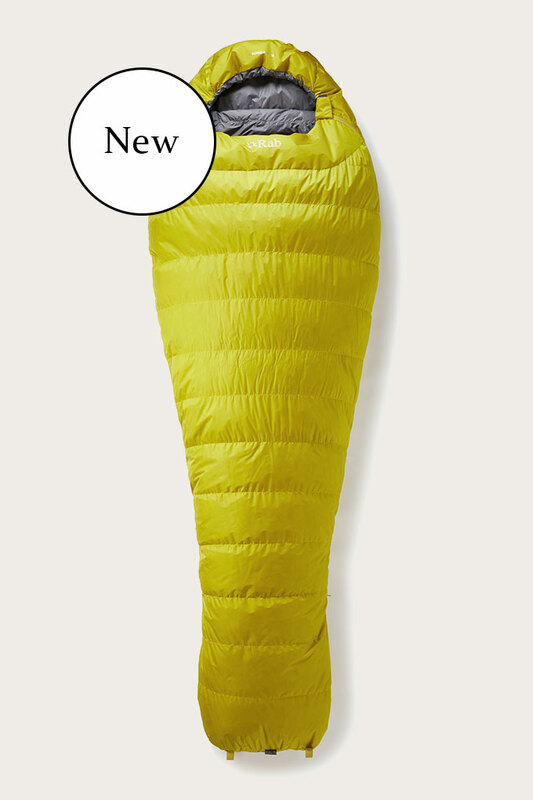 A lightweight and minimalist range of sleeping bags, for situations where warmth-to-weight is a primary concern. C’est une gamme de sacs de couchage légers et minimalistes, parfaits pour les situations dans lesquelles le ratio poids/chaleur doit être optimal. Diese leichten, minimalistischen Schlafsäcke sind perfekt für Situationen, in denen ein gutes Wärme-Gewicht-Verhältnis von großer Bedeutung ist. Designed for those looking to balance warmth, weight and comfort. Rugged and durable, this range offers protection and warmth in cold conditions. Conçus pour ceux qui cherchent l’équilibre parfait entre chaleur, poids et confort. Solide et durable, cette gamme offre protection et chaleur lorsque les températures sont au plus bas. Die Schlafsäcke Alpine Pro wurden gezielt für alle entwickelt, die sich den perfekten Kompromiss aus Wärme, Gewicht und Komfort wünschen. Diese robuste, widerstandsfähige Produktreihe bietet Schutz und Wärme in kalten Witterungsverhältnissen. Ideally suited for regular camping and backpacking, the Ascent range is a great option for those looking to buy their first down sleeping bag. 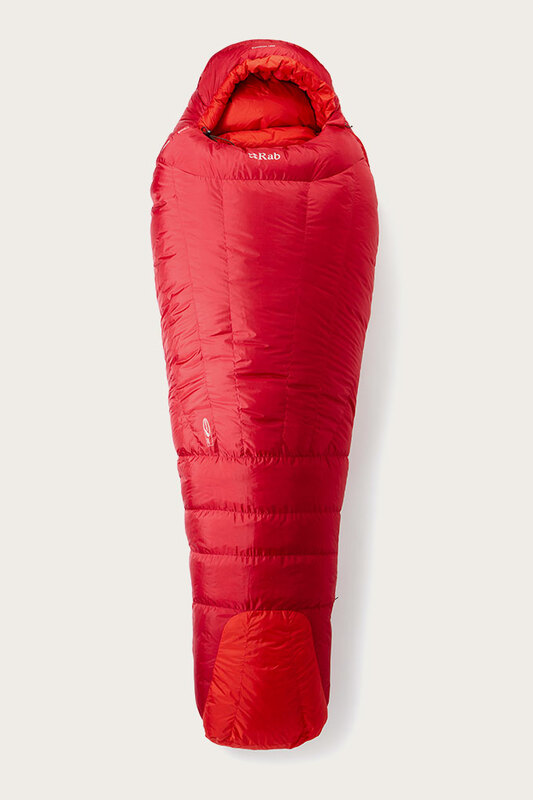 Idéale pour le camping et les voyages en sac à dos, la gamme Ascent est une excellente option pour ceux qui souhaitent acheter leur premier sac de couchage en duvet. Das Ascent-Sortiment ist ideal für einfache Camping- und Rucksacktouren und somit eine fantastische Option für alle, die ihren ersten Daunenschlafsack suchen. A hybrid of technologies, combining hydrophobic down and synthetic insulation for optimal warmth and moisture resistance. Cette gamme est le fruit de technologies hybrides : elle allie un duvet hydrophobe et une isolation synthétique pour offrir un niveau de chaleur optimal et une bonne résistance à l’humidité. 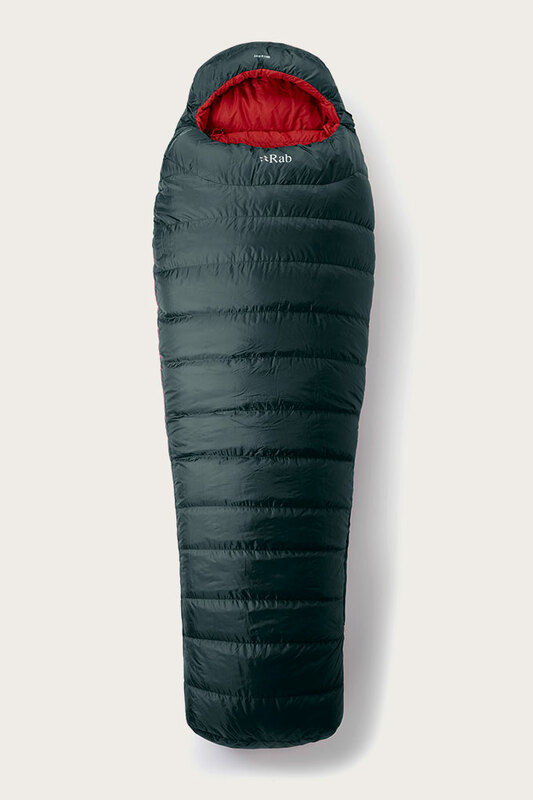 Der Morpheus ist ein wahrer Hybrid-Schlafsack: Er kombiniert wasserabweisende Daunen mit synthetischer Isolation und bietet so optimale Wärme und Feuchtigkeitsschutz. Légers, les sacs de couchage synthétiques de la gamme Ignition sont parfaits pour toutes sortes d’aventures, mais aussi pour camper, quelle que soit la saison. Zum Ignition-Sortiment gehören leichte, synthetische Alljahres-Schlafsäcke für Camping- und andere Outdoor-Abenteuer. 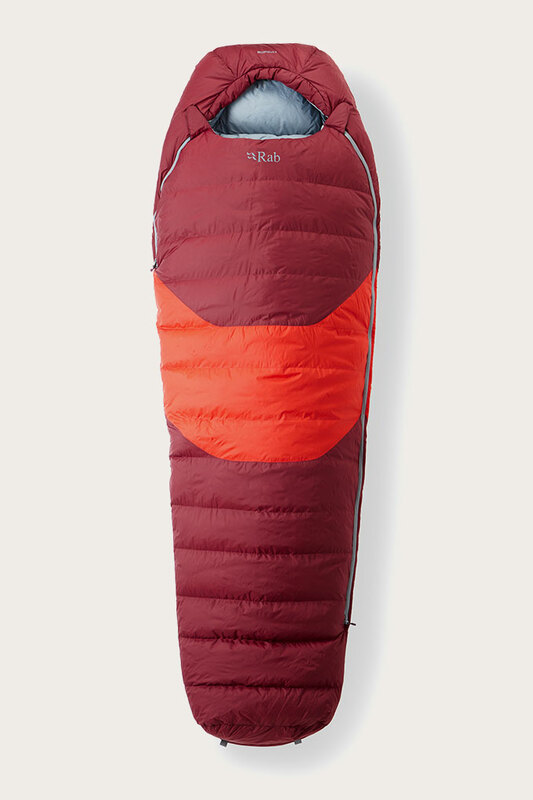 The Ignition range are lightweight, synthetic sleeping bags well-suited for year-round adventures and camping. Rab ships throughout the UK, EU and the United States. All UK orders are shipped free of charge by DPD. Orders placed during the week and before midday will typically be delivered within 48 hours, orders placed on weekends will ship on the following Monday. For more information regarding shipping, including EU and US shipping charges and estimated delivery times, please visit our help center. If you are unhappy with your purchase, please return it to us within 30 days of receipt. The item(s) must be in resalable condition with tags attached. We are currently unable to exchange items and will refund products returned to us under the policy above. Please note, we are not able to accept returns for underwear unless the product is faulty or damaged. We advise that you use a recorded courier service to return your item(s) as we cannot be responsible for items lost in the post. For more information regarding returns and warranty, please see our help center. Get your free download of Basecamp magazine, news updates from our community and the latest product information. For more information please refer to our privacy notice. Or visit our help centre. Cookies on the Rab® website.